Toon Link needs to be unlocked. Toon Link has pretty decent attacks. His jump + falls faster than normal Link and has a greater damage ratio. Also, his Up Smash is one quick, clean slash which hits on both sides of his body and causes good upward knockback. Toon Links shield can block projectiles while standing still, which can come in handy since his only really long ranged weapon is his Bow and Arrow. If you miss while trying to grab someone, you lose time trying to recover your hookshot. 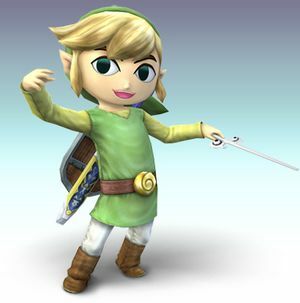 Toon Link is one of the select characters that can save himself with his grab by latching onto edges with his hookshot, though his spin attack makes a much better recovery move. Toon Link has both good projectile and physical attacks. His arrows have shorter range and travel slower than Links and cause less damage (12% fully charged to Link's 15%). His bombs are good, but if you throw them too close to an opponent you can be caught in the explosion. Toon Link can be classified as an above average fighter when it comes to Offense, but his speed and shield give him an excellent Defense. Basic Swordplay Two slashes and a stab. + + + + Axe Slash Brings his sword down like an axe. + + + + Arch Swing Slashes above him. + + + + Low Swing Slashes close to the ground. while dashing while dashing while dashing while dashing Running Slice Toon Link slashes in front of him. Smash + + + (Smash + ) or (Smash + ) or Double Blade Slashes the sword forward. If A is pressed again during the animation of the slash, Toon Link will perform another slash. Smash + + + (Smash + ) or (Smash + ) or Upward Swing Fans the blade upward. Hits behind and in front. Smash + + + (Smash + ) or (Smash + ) or Duo Slash Slashes the ground on either side of him. At low damage,the first slash will knock the opponent into the second one, racking up nice damage. Toon Link uses his hookshot to grab. If the grab misses however, he will experience cooldown. Only use this when you're sure of grabbing the opponent. after grab after grab after grab after grab Hilt Bash Hits the opponent with the hilt of his sword. after grab after grab after grab after grab Forward Tackle Shoulder tackles his opponent. after grab after grab after grab after grab Roll-n'-Kick Rolls backwards with the opponent then kicks the opponent. after grab after grab after grab after grab Upwards Slash Throws opponents upwards then slashes. after grab after grab after grab after grab Touchdown Violently lands on his opponent. Interestingly, Jigglypuff is too light to be hit by the first hit of this move, only taking damage from the second hit. This is toon link's most damaging throw. Double Air Strike Slashes two times around him. + + + + Forward Slash Slashes in front of him. + + + + Backwards Swing Slashes behind him. + + + + Upwards Thrust Thrusts his sword upwards. + + + + Downwards Thrust He sticks his sword downwards. This move can hit recovering opponents to their death. Using it offstage mindlessly is suicidal though. or or Hookshot Toon Link uses his hookshot to attack airborne opponents. This move has good reach. Hero's Bow Hold the button to charge your Bow. The longer the charge is, the further and stronger the arrow flies. Try to use this in free for alls so that the opponent will have a hard time reflecting or dodging the attack. + + + + Boomerang Toon Link throws his Boomerang. His does not have wind properties like Link's, so it does not pull back enemies. It is stronger though. Hold up or down on the control stick or D-pad to curve the boomerang in that direction. + + + + Spin Attack Toon Link spins with his sword out. Enemies caught in the spin will be hit numerous times, like a blender. This attack is chargeable. This move also acts as Toon Link's recovery move. + + + + Bomb Toon Link pulls out a bomb. Tap A (or 2) to throw it. You can add the directional pad to throw it in a specific direction. Jump to add distance to the throw. Be careful, however, as the bomb can be caught and thrown back at you. He pulls out the Wind Waker and conducts with it. At the end, it makes a sound effect from the game. + ( or )+ or or He puts away his sword and shield and looks around in confusion. + He swings his sword madly around, then stops to take a breath. It has the most effect when used at the end of a effective combo attack. Triforce Slash: Toon Link's Final Smash is the Triforce Slash, just like Link's (except it looks more cartoonish). 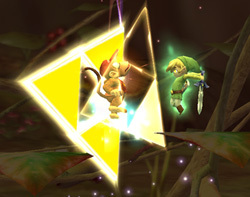 However, the beam of light to start the attack is smaller, due to Toon Link's smaller size. This attack with do 40-50% Damage for the first few hits, then a whopping 13% or so for the final attack, along with a lot of knockback. Most characters won't be able to recover from this attack, but some like MetaKnight and Kirby, as well as heavy characters like Bowser might be able to stand the hit. This page was last edited on 29 May 2013, at 01:21. This page has been accessed 52,456 times.